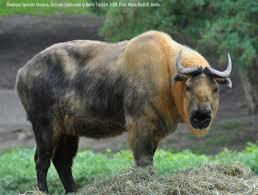 Today I want to write about a really cool, big and strong animal, the takin. These beautiful large goat-antelopes can grow up to 2.2 metres long and weigh up to 350 kg. Their horns can grow up to 64 cm long and males use them when sparring with each other at breeding time. They are very well adapted to living in cold mountain regions. They have split hooves that help them to climb in dangerous areas. Their long fur keeps them warm in winter and is then shed in summer so that they can stay cool. Their fur is also very oily which helps it to stay waterproof. Finally, their funny looking nose helps them to warm up the air before it gets to their lungs, much like the snout of an elephant seal. The takin is a very elusive animal. They live in groups of up to 20 animals and will make a loud coughing sound when disturbed which tells the herd to run and hide on the ground in thick bamboo where they are difficult to find. There are four different sub-species, the Sichuan, golden, Bhutan and Mishmi takin and they are found in the high mountains of India, China, Myanmar and Bhutan, where they are the national animal. They are considered vulnerable to extinction. Are there any other interesting facts that you would like to share about takins? When questioned, the Takin does not prefer to comment on world politics.